Think of all your favourite ingredients, mixed and matched just the way you like them. Great for kids to build their own creations - perfect for fussy eaters too. 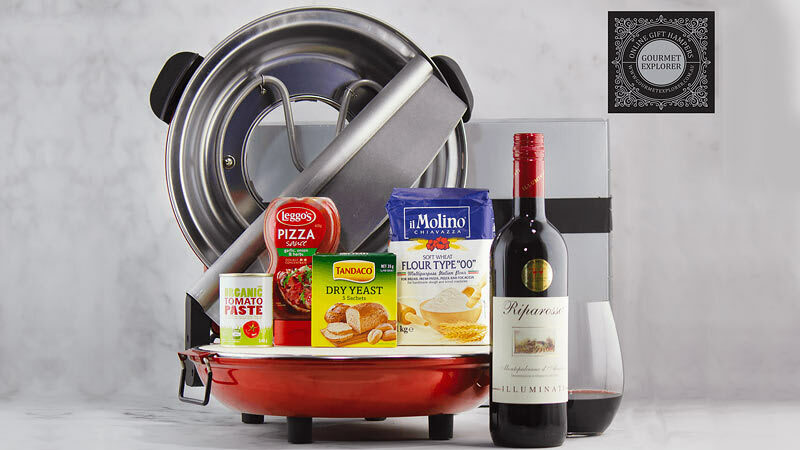 Meal times just got faster, more fun and delicious with your very own Pizza Oven Kit! Enjoy your favourite toppings matched with just the right amount of cheese and cooked just the way you like it! Great for delicious family meals in minutes, quick snack or healthy alternative to fast food. The Pizza Oven with the interchangeable stone base and deep dish pan is specially developed to make pizzas. The unique stone base delivers an intense heat which absorbs any moisture, ensuring your pizza has a crisp base right from the centre to the crust. Create thick crust pizza using included deep dish pan. The Pizza Oven Kit is a great way to make more fun and better food in the kitchen. In no time you will be making crisp, delicious gourmet pizza at home. You'll also receive all the ingredients to get you cooking - including your very own pizza oven! We deliver fresh pizza flour, dry yeast, tomato paste, savoury pizza base.